One family had to be stronger than ever recently. Mountain Home Air Force Base (MHAFB) will welcome home approximately 150 airmen Tuesday night. The 391st “Bold Tigers” Squadron of F-15E aircraft has been deployed in Southwest Asia for the past several months. MOUNTAIN HOME, Idaho — Mountain Home Air Force Base (MHAFB) will welcome home approximately 150 airmen Tuesday night. The 391st “Bold Tigers” Squadron of F-15E aircraft has been deployed in Southwest Asia for the past six months or so, according to a source. 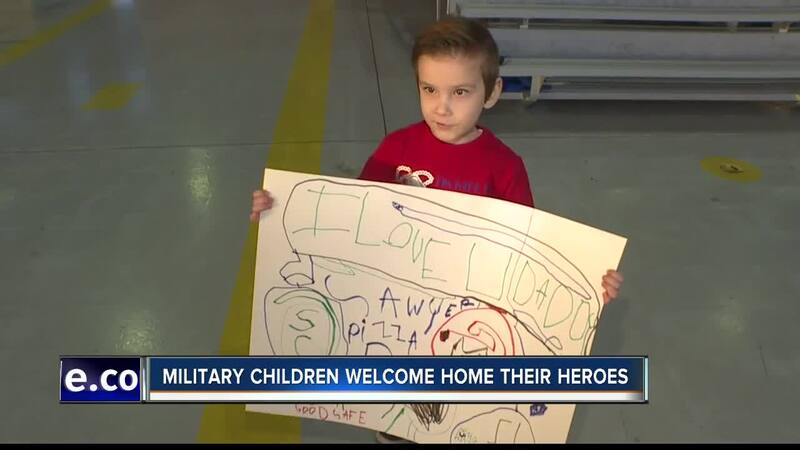 Just in time for “Month of the Military Child,” families, friends, and military officials will welcome home the squadron at approximately 9 p.m. when they step off a commercial flight in a base hangar called “Bold Tigers,” according to MHAFB officials. This is the first deployment The Tuttle children have experienced with their father, and the longest they have been away from him. "I might happy-cry when daddy comes walking through the door," said Korah Tuttle, daughter of an airman. The second grader could not wait to show her dad her new smile. "On the phone he calls me 'Toothless.'" In the past six months, while her father was deployed, Korah lost four teeth! "This one got yanked out at home, when I put some water in my mouth, this one, uhm, my mom yanked out!" said Tuttle, demonstrating. And that's not the only thing mom's done lately. "I'm used to having a partner, someone who can have my back, someone who can tag in when I need to tag out," said Ellyce Tuttle, wife of an airman. But she says there was simply no time to get too sad about it. "I've been so busy and more concerned about trying to keep it light and not such a sad time for them, that I haven't had time to really dwell on it as much." Korah said she's missed her dad's funny jokes. And 4-year-old Sawyer couldn't wait to tell him this: "I love you daddy." But all that changed Tuesday night, when approximately 150 airmen stepped off a flight into the arms of their loved ones. "What did you say when you hugged him?" asked Ellyce. "I missed you. I love you," said Sawyer. Master Sergeant Joshua Tuttle says he is ecstatic to be back with his wife, son, and "toothless" daughter. "They actually have it harder than I do-- at least I have work to do and keep my mind busy, but with them, they're asking 'Why?' and all that," said Msgt. Tuttle. But Sawyer says he is just happy to no longer have to deal with this: "poor connection!" His mom explained. "When we videochat we always get a poor connection." The “Tigers,” according to officials, have been busy executing all-weather, all-night missions including suppression of enemy air defenses. The airmen are capable of employing the full array of U.S. Air Force weaponry including air-to-air missiles, 20mm gun, and laser-guided and GPS munitions.